Today we celebrate a great milestone in the life of this parish. We gather here this morning to close out the 150th anniversary of Our Lady of Victory Church. For the past 9 months, we have celebrated with great joy, the rich history of this beautiful church. We have looked back to the foundation left before us by the priests, consecrated religious, seminarians and lay faithful of Our Lady of Victory Church. We thank Almighty God for the generous benefactors who built this magnificent church, who by the way purchased this land in 1868 for only $25,000. I don’t think you could purchase a quarter of land here in Bedford Stuyvesant for that amount of money today! 150 years later, we continue to spread the Good News of Jesus Christ to all of God’s people. Over the last year, we have also looked to the future, and what a bright future we have! Although we have seen our neighborhood change over the years, our mission as a community of believers always and forever remains the same! We are a vibrant community, filled with God’s love and mercy. We are a community filled with love for the Lord Jesus and his most Holy Roman Catholic Church. We are blessed to have young families who keep Jesus at the center of their lives. We are immensely blessed to have the pillars of our church, whom we honored at our Gala Dinner last month, as continued support for this parish community. Since our canonical merger in 2007 with Holy Rosary and St. Peter Claver churches, we have become even stronger in the spreading of the faith. Every time I celebrate Sunday Mass at each of our beautiful churches, I am reminded of how blessed I truly am to be the shepherd of an amazing and wonderful flock. Our theme for the Anniversary Year was “Coming Back Home to Our Lady of Victory”. I take this opportunity to welcome all of you back home today! Whether you were a parishioner who moved away from the parish, or an alumni of the grammar school, this church will always be home. In a very special way, we welcome His Excellency, Most Reverend Nicholas DiMarzio, Bishop of the Diocese of Brooklyn to our celebration this morning. We thank him for celebrating this Mass with and for us today. We also welcome the former priests of the parish who are here with us, most especially the former pastors. I thank them for their fraternal support, guidance and prayers. In a very special way, I thank the anniversary committee, who worked so hard to make the events of this past year and the culmination to this day so beautiful. I thank them for their dedication and support, not just during this anniversary year, but each and every single day. I thank my staff, including Father Daniel Kingsley, who are my collaborators in guiding and shepherding this amazing flock closer to the heart of Christ Jesus. Although this Mass ends our anniversary year, we must continue the work of bringing Christ to all of God’s people here in Bedford Stuyvesant. Through the powerful intercession of St. Martin dePorres, Our Lady Queen of the Most Holy Rosary, St. Peter Claver and Our Lady of Victory, may the Lord continue to bless us now and for ages to come. Today we celebrate the Solemnity of Corpus Christi, that is the Body and Blood of Christ. As Catholics, we believe that our Lord is truly present, body, blood, soul and divinity in the Eucharist. It is through the sacred hands of a priest that the Lord comes from heaven, to earth upon our sacred altars. At every single Catholic Church in the entire world, the Lord Jesus is present in the tabernacle. We must always show the utmost reverence to the Most Blessed Sacrament. When we approach the altar to receive the Lord, we must do so in a spirit of profound reverence and respect. When in procession to receive the Lord, we must not fall into the habit of greeting parishioners and friends. That can be done after Mass. When we are in procession to receive the Lord, we must use that time to meditate on the great gift that we are about to receive, that is Jesus himself! It should be a moment of deep prayer and reflection on the love God has for us through his Son Jesus, who gives of his very self for our nourishment and sustenance. In his very last encyclical letter to the Catholic Church before his death, Pope St. John Paul II wrote on the beauty of the Eucharist and the Church. Entitled, Ecclesia de Eucharistia, Pope Saint John Paul II wrote of the importance of Eucharistic Adoration, praying before the Lord’s Eucharistic presence which will strengthen our faith in him. The Holy Father wrote, “It is pleasant to spend time with him, to lie close to his breast like the Beloved Disciple and to feel the infinite love present in his heart. If in our time Christians must be distinguished above all by the art of prayer, how can we not feel a renewed need to spend time in spiritual converse, in silent adoration, in heartfelt love before Christ present in the Most Holy Sacrament? How often, dear brother and sisters, have I experienced this, and drawn from it strength, consolation and support!”. On this Corpus Christi Sunday, let us continue to renew our relationship with the Lord in the Most Blessed Sacrament, by worshiping him reverently, and spending time before him. The solemn closing Mass for the anniversary year will take place next Sunday June 10 at Our Lady of Victory Church beginning at 10:30AM. Many of the former parishioners of Our Lady of Victory will be present along with alumni of the school. Many of the former priests of Our Lady of Victory will be on hand to con-celebrate as well. We will welcome His Excellency, Most Reverend Nicholas DiMarzio, Bishop of the Diocese of Brooklyn as the main celebrant and homilist. There will be just one Mass celebrated next Sunday. After the Mass there will be a reception in McGuinness Hall. We are asking for donations of breakfast items such as croissants, bagels, juices and danishes. If you are able to help donate some of these items for the reception, please call the parish office this week. There will be a Saturday 5:00PM evening Mass at St. Peter Claver Church June 9. May the heart of Jesus in the Most Blessed Sacrament be praised, adored and loved, with grateful affection at every moment in all the tabernacles of the world, even until the end of time, Amen. We had another successful and phenomenal fundraiser last Sunday afternoon! Our Shades of Color concerts was incredible. As I did publicly last week, I want to again thank all who came out to support this amazing parish and our phenomenal choir under the direction of Mr. Rasaan Bourke and Mr. Joseph Murray. The brass instrumentalists, the voices of our choir, our magnificent organ and our modern dancers were all a part of this afternoon of cultural diversity and fraternity. As all of our anniversary fundraising events have accomplished, many new people came out to see this concert. I had the great joy of meeting a new family who just moved into Bedford-Stuyvesant. They saw the post card advertising the concert and decided to come. After the concert, they told me that they will become registered parishioners of the parish. These events have truly been moments of evangelization and renewal. I thank the entire anniversary committee for their hard work, but most especially for their love and support of this great parish. The solemn closing Mass for the anniversary year will take place on Sunday June 10 at Our Lady of Victory Church beginning at 10:30AM. Many of the former parishioners of Our Lady of Victory will be present along with alumni of the school. Many of the former priests of Our Lady of Victory will be on hand to con-celebrate as well. We will welcome His Excellency, Most Reverend Nicholas DiMarzio, Bishop of the Diocese of Brooklyn as the main celebrant and homilist. There will be just one Mass celebrated that day. There will be a Saturday 5:00PM evening Mass at St. Peter Claver Church on June 9. I take this opportunity to thank each of you for your support and generosity towards this year’s Annual Catholic Appeal. 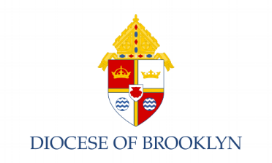 Over the last two weeks, I have spoken to you in my homily about the importance of the ACA and its support of the various ministries within the Diocese of Brooklyn and our parish here at St. Martin dePorres. Our goal for the year is $59,519. As I mentioned, if each of us can participate in some way, we will be able to achieve our goal. Anything that we make over the goal comes directly back to the parish. There are extra pledge forms at each of the three churches. Today is Mother’s Day. I take this opportunity to wish all mothers, grandmothers, godmothers, step-mothers and mothers-to-be a very happy a blessed Mother’s Day. The month of May is traditionally devoted to our Blessed Mother Mary. During the month of May, we will remember all mothers both living and deceased. If you wish to have your mother remembered, there are Mother’s Day envelopes at the doors of the three churches. Please fill out the envelope, place your offering in it and place it in the collection basket or return it to the parish office. The envelopes will be placed by the tabernacle throughout the month of May.